Today is the day the tree comes down and goes out the door. I don’t know about you but I hardly enjoy taking down and cleaning up anything. I have 128 glass drops and about 50 crystal icicles in various sizes to take down. 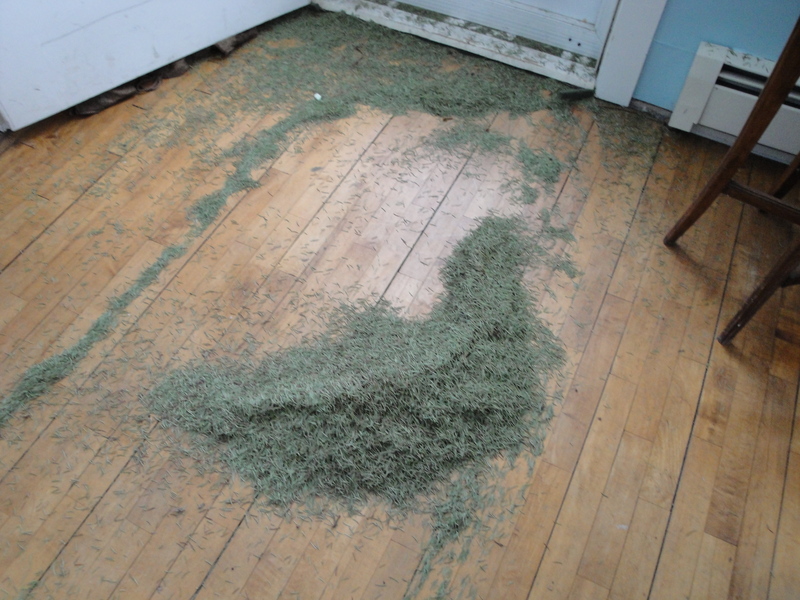 Thank goodness it’s easy this year, I just blow on that tree and 1/3 of the needles are on the floor. This makes the glass and crystal ornaments easier to spot, heehee. Ok, I got it done and then Ty pulled the tree through the front door holding it by the tip. That, clearly, was a mistake ! The second third of all needles landed INSIDE while the almost bare nakkit tree is now on the front porch. I hated the thought every year of taking the tree down, and those darn needles in the carpet. We now have a artificial tree, which I must say looks great but doesn’t smell the same. Oh well, Happy New Year, and hope to see you soon. See those artificial trees just feel dusty to me. I had one a couple of years ago when I was too busy to do the fresh tree and I hated that. I take the needles any day. Yes, I would love to have the tree a bit longer. I like the lights, it looks so happy. Grandma just turned me on to your blog, she really enjoys reading it! Your Christmas cookies looked beautiful and delicious. Hi Courtney, wonderful to have you here. I didn’t know that your grandma was a regular visitor of my blog. That makes me so happy. We have an artificial tree and I do miss a real tree but after that picture, I’ll stick to the artificial. Crisp Spruce/Yankee Candle fills our home with the smell of a real tree. Mark takes everything down around the middle of Jan. It sure does look bare when it’s gone. We’re actually in the market for a new tree. That’s how I stumbled upon Bonner’s. Check out their web site. They have beautiful artificial trees just a little pricey but beautiful! ummm, I wanna come. Not to buy a tree though, for cocktails, yes? Wouldn’t it be fun to have a big girls pj party? Wished I lived closer!